Another NAMM show has come and went, so let me start off by saying that NAMM 2014 was very cool in a lot of ways. There were off-the-hook large crowds, which was good because the exhibition had a lot of energy and vitality, but also bad because traffic and parking were the worst I've ever experienced. One of the days it took me a half-hour just to get off the 5 Freeway onto Harbor Blvd, then another hour to park. I spent a lot less time in the audio hall (Hall A) this year than in the past, mostly because there was a lot to see almost everywhere. That said, here are some general show observations. This was probably the busiest NAMM I've had in a long time. Back to back to back meetings all day every day was pretty grueling. I did a number of "photo ops" during the show that were fun though. Here's one with the gang from Alfred Publishing. 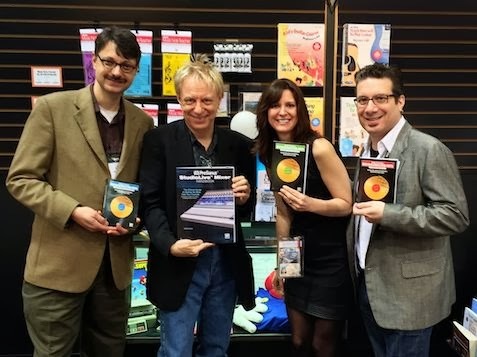 We're all holding new books of mine that made their debut at the show including Presonus StudioLive: The Official Guide, and the Deconstructed Hits series. While at NAMM I got a call to go to CNN in Hollywood to comment on a story I wrote for Forbes about Justin Bieber breaking his brand. I think they aired at least some of it during the day (I didn't see it myself) as I saw a big spike in blog readership. Thanks, CNN! I also did a great panel called "Getting Great Guitar Sounds" with Scott Kahn from Musicplayers.com, guitarist extraordinaire Doug Doppler, Prince engineer and old buddy Dave Hampton, and author Bill Gibson, who was the moderator. Thanks for including me, Bill! First of all, thanks to Paul, Marie-Ann, Rueben, Nick, Greg and Hovak for joining me on my tour of the audio products in Hall A on Friday. We saw a lot of company's booths and I think we all had a good time. Thanks to Brad Lunde at Transaudio Group (ATC, Drawmer, Bock), Eveanna Manley at Manley Labs, Rick Naqvi at Presonus, JD at Universal Audio, Ted Kefalo at Equator, Robby Sharf at Neumann, Dave Morrison at IsoAcoustics, Antoni Ozynski (no relation) at PSP, John Jennings at Royer, Dusty Wakeman at Mojave, and Larry Droppa at API for taking the time to tell us about your latest products. The general mood of the show was extremely upbeat. 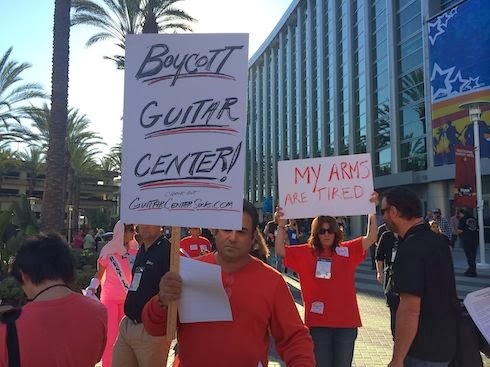 For the most part, manufacturers seemed to be experiencing brisk sales (although they can't officially sell at the show), and everyone I spoke with, from musicians to journalists, were experiencing busy times once more. If you haven't noticed, the economy is back, and this show proved it. Not all manufacturers appeared to be doing well though. Peavey moved from its traditional spot in the center of Hall B to the darkest part of the second floor in a place that no one ever ventures. The result was a much less impressive booth and from what I could tell, very little traffic. Mackie was the same. Now that it's owned by Loud Technologies, you won't even see the Mackie name mentioned, only the little running man logo. Once again, this was a company that was once in the center of things on the floor of Hall B or C, and is now relegated to a very small room on the second floor. As a matter of fact, the entrance was labeled Ampeg (which Loud also owns), so unless you were going to check out a bass amp, you wouldn't know that Mackie/Loud was even there. I sense a rebranding here with the Mackie name disappearing forever in the near future. This may very well be the year that software took a backseat to hardware. There were fewer software apps and a lot more boxes around, especially in the downstairs Hall E were all the small boutique manufacturers start their journey to retail. There were far fewer iOS apps than in previous years, and the ones that were were more or less expected to be attached to the hardware device they paired with. In general, that meant there's now a tighter integration of hardware and software as a single product, rather than two separate ones. Another trend was that there were far fewer booth babes this year, which kind of defies a NAMM tradition. This was probably a good thing as I read a study were good looking women in a booth actually decreases traffic by about two-thirds. Finally, regardless of the music that seems to hit the top 40 these days, rockers still reign supreme at NAMM. You'll see longer hair, more tattoos, more body piercing and more spandex than anywhere else at one time. I guess some things never go out of style. I think this pictures says that all the good names for companies must be already taken. 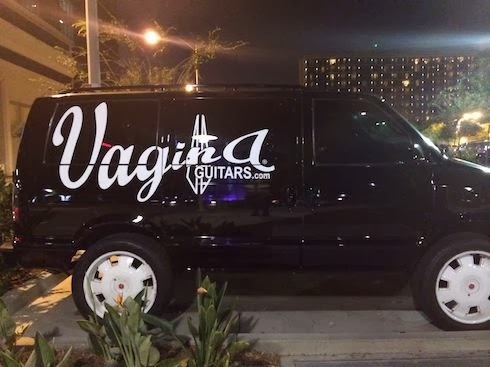 As far as I could tell, this company didn't exhibit at NAMM, but they did have a prominent parking space every day right near the convention center. It was great marketing because everybody that walked by commented, and I even saw people getting their picture taken in front of it. And the show was not without it's share of protests. This one was generated by the fact that an inventor showed an exec at Guitar Center an idea for a pedal for a cajon, who then allegedly turned it over to Gibraltar Hardware to make. Can't say who's right here, but they had a healthy protest. Also, check out the second sign on the back right for some nice irony. 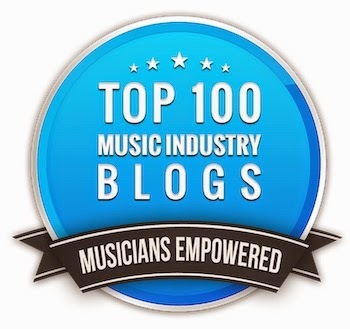 Many of these manufacturers in Namm Show 2016 unlike most bands, have fora where a lot of info is shared. Of course, i understand this isn't the same as a Facebook or Myspace link, but nevertheless quite effective in getting their message across.